Daktarin oral gel is a prescription medication used to treat fungal infections in adults and children over the age of 4 months old. As it is a gel that is applied orally, it is used in the treatment of mouth, throat, and gullet fungal infections. Oral fungal infections, otherwise known as oral thrush, are caused by an imbalance in the amount of fungi. Thrush occurs when the fungus known as Candida grows in numbers. There are a number of factors which cause this fungus to multiply such as a weak immune system, taking antibiotics, or poor oral hygiene. Daktarin oral gel is used to kill the fungi and stop it from multiplying and spreading. 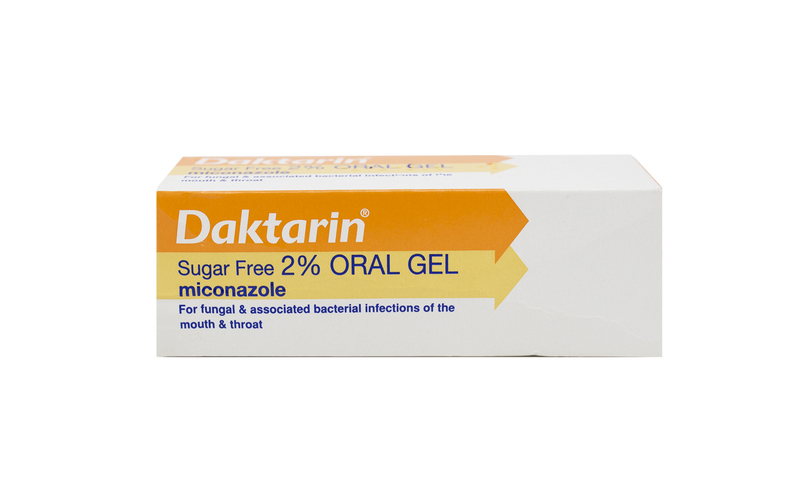 Daktarin oral gel contains miconazole which is an antibacterial medicine used to kill fungi to prevent it from overgrowing. It does this by making holes in the cell membranes which are essential for the survival of the Candida fungus. The contents of the cells are forced to leak out through the holes, and without this the fungi will eventually die. Once the production of fungi is controlled the infection will eventually clear. Who is Daktarin oral gel suitable for? This medicine is suitable for adults or children with a fungal infection in the mouth, throat or gullet. Oral thrush is more common in babies, children, and elderly people, but it should not be used in children under 4 months old. Take care when giving this medicine to a child or infant, ensure that the gel does not close their throat, apply it at the front of the mouth. Who is Daktarin oral gel not suitable for? There are a number of factors which may make you unsuitable to use this medicine. If you’re taking other medication that may interact with the ingredients in this medicine, or if you have a health condition which could be worsened by Daktarin oral gel, then this may not be the most suitable treatment for you. You may also not be suitable for this medicine if you are pregnant, planning to become pregnant, or are breastfeeding. Always consult a doctor before taking Daktarin gel if any of the above apply to you. There is a risk of small infants choking on this sticky substances and so Daktarin oral gel is not suitable for infants under 4 months old. You may still be able to use Daktarin oral gel but this will need to be decided by your doctor. Your doctor can an informed decision on whether using this medicine is safe for you and your baby. If you are breastfeeding ask a doctor or pharmacist about whether this gel will affect your baby in any way. You may not be suitable to use Daktarin oral gel if there is a risk it could make an existing medical condition worse. If you have liver problems you should not use Daktarin oral gel as there is a risk of symptoms becoming worse. If you have an allergy to miconazole, or any other ingredient in this medicine you should avoid this treatment. Allergic reactions can be life threatening so it’s important to avoid triggers to prevent a reaction. If you know you’re allergic to any other antifungal medicines, it’s likely that you’re also allergic to Daktarin oral gel and this form of treatment will not be suitable for you. If you’re showing signs of an allergic reaction such as skin rash, breathing difficulties, or swelling of the face, lips, tongue, or throat, discontinue use and seek medical help immediately. You should also inform your doctor about any other medications you’re taking, for instance, blood thinning drugs such as warfarin or HIV medicines such as saquinavir. There are plenty of other medicines on the patient information leaflet which your doctor should be notified about if you’re currently taking them to ensure it is safe to prescribe Daktarin oral gel to you. How to use Daktarin oral gel? This gel is for oral use only and you should keep it in your mouth for as long as possible, try not to swallow it straight away. The gel is applied directly to the infected area with a clean finger, wash hands thoroughly before and after applying the treatment. Apply the gel after meals 4 times a day, for adults the recommended dose is 2.5ml and for infants between the ages of 4 months and 2 years, the dose is 1.25ml. However, this dose depends on the development of the child, if your child is premature or has slow development you should speak to your doctor first as this medicine may be unsafe due to it being a choking hazard. Are there any side effects of Daktarin oral gel? All medicines have some side effects but not everyone will experience them. Side effects of Daktarin oral gel range from common (affecting 1-10 people in 100) to rare (affecting 1-10 people in 1,000). Some side effects affect a very small amount of people but they are serious and need medical help right away. If you experience any of the following side effects you should consult your doctor as soon as you can to discuss lowering the dosage or using an alternative treatment. There are some serious side effects which will mean stopping this treatment immediately and seeking medical help if you have a severe allergic reaction, if you develop severe skin problems such as a rash or peeling and blistering of the skin, you may develop a serious skin disorder known as Steven-Johnson Syndrome. You may also need medical help if you’re experience light headedness or difficulty breathing. If you take blood thinning drugs such as warfarin with Daktarin oral gel you may experience serious side effects such as unexpected bleeding or bruising. Is Daktarin oral gel an effective treatment? The active ingredient in Daktarin oral gel can effectively kill the fungi that causes the infection. To ensure the infection has fully cleared and to prevent the infection returning you should continue to use this medicine for 7 days after the symptoms have gone. How to buy this medicine online? You can buy Daktarin oral gel online safely at Doctor-4-U. To do this you will need a prescription from a General Medical Council (GMC) registered doctor which Doctor-4-U can provide. You can order your prescription medication from the comfort of your home by submitting a medical consultation form and relevant details which are reviewed by our online doctors to determine your suitability. Once your suitability for this medication has been approved our UK-based pharmacy will dispense it and send it to you via a tracked courier service.